Description: QUARTER CENTURY THEATRE is a new contemporary theatre company in Collingwood, spearheaded by owner and Artistic Director, Rochelle Reynolds. Joining Dianna on this week's BEACH CORNER is Rochelle Reynolds and Artistic Associate, Khaleel Gandhi who will share information on this new urban theatre company. Beach BOOSTER Photo: (left to right) Graham Ashton, Artistic Producer, Rochelle Reynolds, Artistic Director, Khaleel Gandhi, Artistic Associate, host Dianna Chycki. QUARTER CENTURY THEATRE is a new contemporary theatre company in Collingwood, spearheaded by owner and Artistic Director, Rochelle Reynolds. Joining Dianna on this week's BEACH CORNER is Rochelle Reynolds and Artistic Associate, Khaleel Gandhi who will share information on this new urban theatre company. 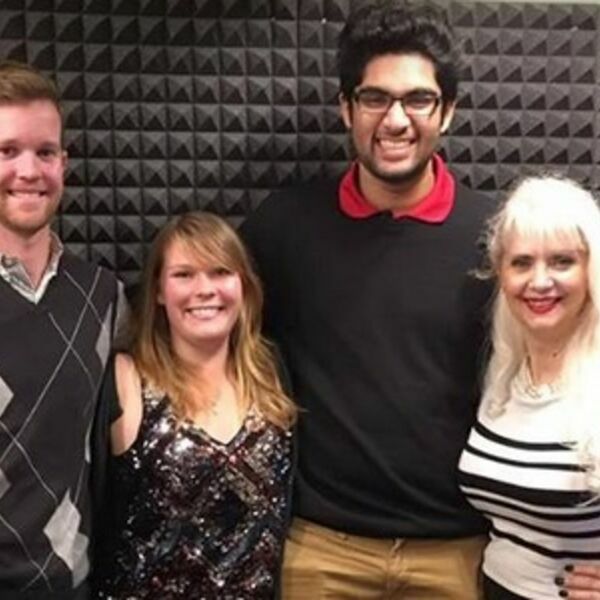 Beach BOOSTER Photo: (left to right) Graham Ashton, Artistic Producer, Rochelle Reynolds, Artistic Director, Khaleel Gandhi, Artistic Associate, host Dianna Chycki.